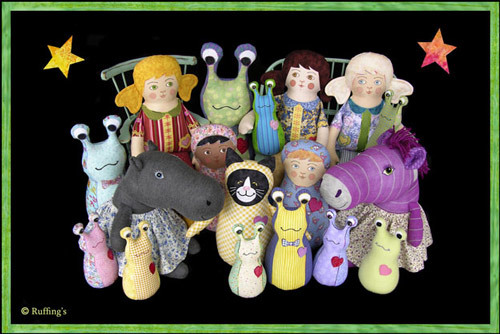 Elizabeth Ruffing also makes a variety of soft dolls and whimsical art toys, such as her “Hug Me Slugs”, other fleece toys, and sock animals. Please visit Elizabeth’s Etsy toy shop at hugmeslug.com to see her latest available creatures. She is also posting some toys on eBay. Elizabeth has a studio blog where you can look behind the scenes and see what she is working on next. Be sure to “like” Hug Me Slugs and Friends on Facebook too, to keep up with newly posted dolls and toys.